Sometimes, people ask me if I have managed to make it through The Silmarillion. Wits have called this particular work “a telephone directory of Elvish names.” I really don't know why; the Silmarillion is considerably easier reading than the book of Numbers or the Iliad, and significantly shorter than the latter. Let me lay some groundwork. As I've mentioned several times this week, the Quenta Silmarillion is the body of legends which constituted JRR Tolkien's major life's work and his attempt to construct a myth for England. Unlike most artists, the work that was dearest to his own soul was never published during his lifetime, while the parts that were published—The Hobbit and The Lord of the Rings—were mere tributaries to the magnumopus. This was because Tolkien never arrived at a completed version of the legends. It became clear to me that to attempt to present, within the covers of a single book, the diversity of the materials—to show The Silmarillion as in truth a continuing and evolving creation extending over more than half a century—would in fact lead only to confusion and the submerging of what is essential. I set myself therefore to work out a single text, selecting and arranging in such a way as seemed to me to produce the most coherent and internally self-consistent narrative. The book we know as The Silmarillion is the result of Christopher Tolkien's editing-together of a formidable body of his father's stories and notes—hundreds of earlier and even some later versions remain, catalogued in the twelve-volume History of Middle-Earth series. The Silmarillion itself contains five of Tolkien's writings. 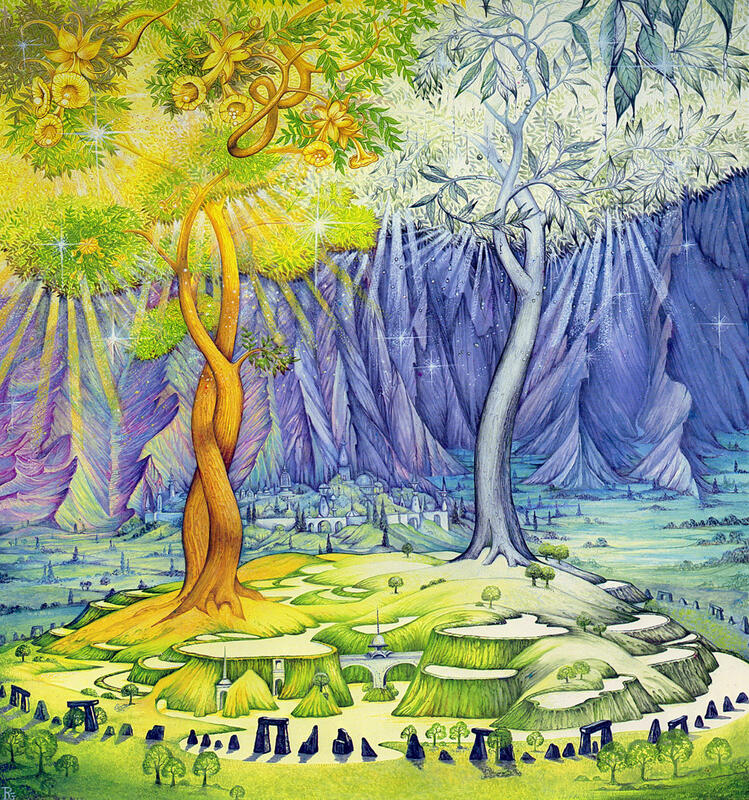 Eru then gives the music of the Ainur shape in the world, showing them a vision of the world as it will be. At that point, however, it was yet unformed, and certain of the Ainur go down into the world to form it, taking on bodies and going to work to make the world fit for the Children of Iluvatar—Elves and Men. This short essay introduces the reader to those of the Ainur that descended into the world to rule it. 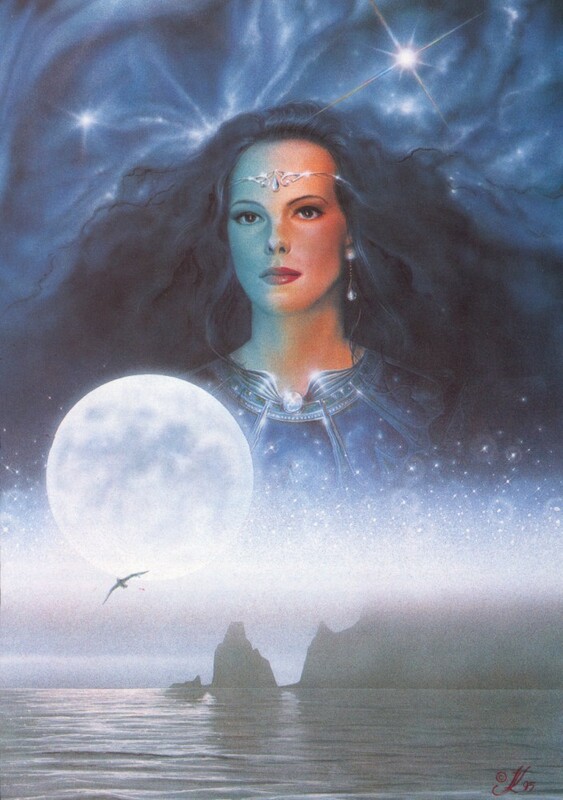 The fourteen greater spirits are known as the Valar and include Manwe, supreme among the Valar. The great Eagles you have met in The Hobbit and The Lord of the Rings are his servants. Manwe's consort is Varda, maker of the stars, who is especially venerated by the Elves, who call her Elbereth Gilthoniel. “Men have often called them gods” says Tolkien of the Valar. Yet they are obviously subservient to Eru and might be more correctly named angels, although the similarity to Greek and Norse pantheons is probably intentional. In addition we are introduced to Melkor, later named Morgoth, who descends into the world to become the first Dark Lord, as well as his many henchmen including a Maia named Sauron. This begins with the Valar's attempts to finish the raw materials of the world and their wars with Melkor. They capture him and an age of peace results during which the first Elves (including the families of the Noldor) awake and are brought to live in Valinor. 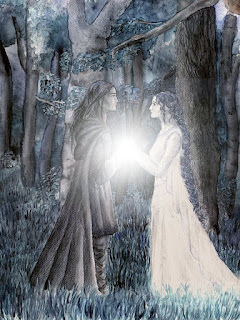 There is no sun or moon, so Yavanna, a Vala, grows Two Trees in Valinor—one shining gold, the other silver. The greatest of the Noldor, the smith and craftsman Feanor, forges three marvellous jewels containing the brightness of the Two Trees. These, known as the Silmarils, are the greatest of the creations of the Children of Iluvatar. 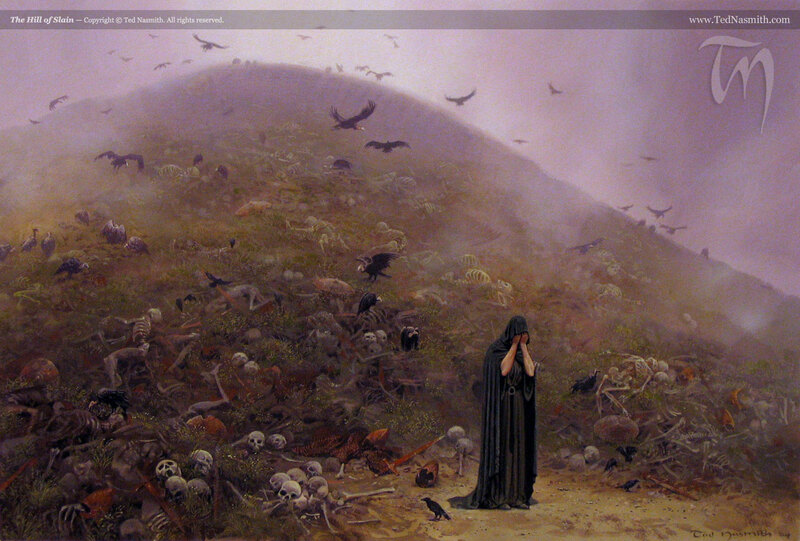 Melkor pretends to be repentant and is unchained and allowed to mix with the people of Valinor. However he detests and lusts for the light of the Two Trees and eventually, with the help of the abominable spider Ungoliant, Melkor murders Feanor's father Finwe, High King of the Noldor; steals the Silmarils, attacks and kills the Two Trees, and flees Valinor for Middle-Earth. 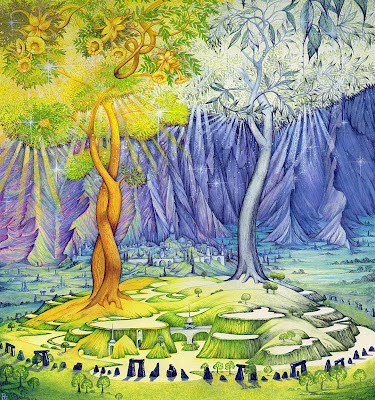 The Two Trees could never be remade—the saplings that had been taken from the Silver Tree would never be as glorious—and the Silmarils were lost. Only one golden fruit and one silver flower were left, which were set in the sky as the sun and moon. 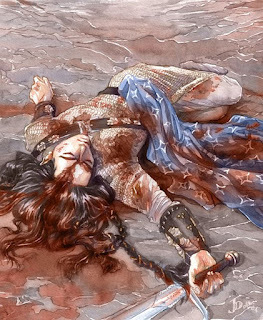 Feanor is grieved by his father's death but enraged beyond words by the theft of his greatest workmanship—now the only things containing the unsullied light of Valinor. 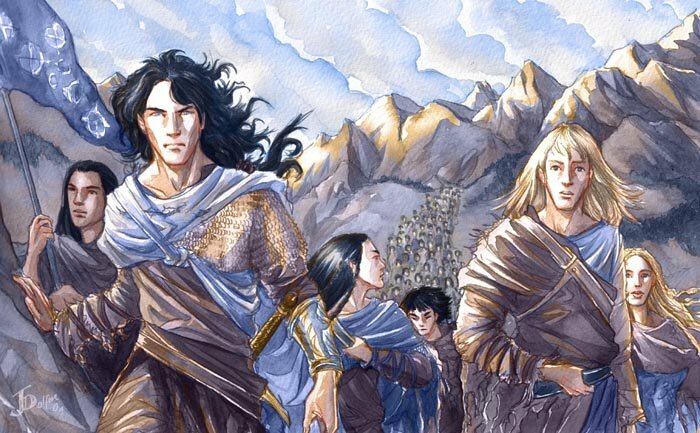 Together with his seven sons and as many of his people as he can convince to follow him, Feanor swears an oath to return to Middle Earth and make war on Melkor, whom he renames Morgoth, until the Silmarils are recovered. The Valar command the Noldor to remain in Valinor, but the Noldor rebel, rob the Teleri Elves of their ships in the First Kinslaying, and flee to Middle-Earth. As they travel, they meet Mandos, herald of the Valar and keeper of the dead. Mandos delivers the Valar's curse: the Noldor will be exiled from Valinor, and everything they do will be doomed. “To evil end shall all things turn that they begin well; and by treason of kin unto kin, and the fear of treason, shall this come to pass.” Led by Feanor, the Noldor refuse to turn back. Morgoth has a fortress prepared in the far north of Middle-Earth—Angband--where he retreats to build up an evil army: Orcs, corrupted from Elves; dragons, werewolves, Balrogs, and so on. The Silmarils he sets in his Iron Crown. The Noldor, a mighty army, land in Beleriand in the west of Middle-Earth and soon carve out kingdoms for themselves, driving Morgoth back into Angband and keeping him under tight siege. But Morgoth is only waiting to build up his strength, and the next six hundred years of the First Age of Middle Earth will be one long war in which both Morgoth and the Valar's curse will hound the greatest Elves and Men to death and defeat. This is a brief history of the Second Age. After the War of Wrath finally ends the War of the Jewels, the Valar reward the Men of Middle-Earth with a magnificent island nation, Numenor. Numenor stands as a glorious civilisation for many centuries, but in the end it apostasizes with the eager help of an old enemy—Sauron, Morgoth's former lieutenant and maker of the One Ring. Eru sinks Numenor below the waves, and only a remnant survive: Elendil and his two sons, who will go on to lead the armies of Middle-Earth against Sauron at the end of the Second Age. This briefly recounts the history of the Third Age, leading up to and including the events of The Lord of the Rings. 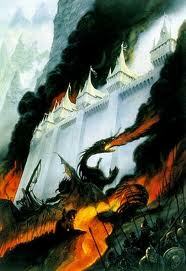 The main content of The Silmarillion is the War of the Jewels taking place in the First Age. Since Tolkien intended to compose an epic legend cycle, you'd better be ready for a series of grand-opera-tragedies: The Silmarillion is not a novel, but a collection of legends. Last of all Hurin stood alone. Then he cast aside his shield, and wielded an axe two-handed; and it is sung that he axe smoked in the black blood of the troll-guard of Gothmog until it withered, and each time that he slew Hurin cried: 'Aure entuluva! Day shall come again!' Seventy times he uttered that cry. There's the story of Turin Turambar, Hurin's son. Hurin is dragged to Angband after the battle, where he defies Morgoth and is subsequently chained to a chair high in the mountains of Thangorodrim, above Angband. From here he is forced to watch the unfolding tragedy: his daughter Lalaith dies, his son Turin grows into one of the greatest mortal heroes of Middle-Earth but is constantly led astray by a haughty temper, his daughter Nienor, under the spell of a dragon, goes mad and forgets who she is, and his wife Morwen wanders alone in the wild looking for them. In the end, after they are all dead in the most horribly depressing circumstances, the reader is left wondering what Tolkien meant by it—but that may be a discussion for a review of The Children of Hurin. The Silmarillion defies most of the criticisms of Tolkien that exist—many, having read The Lord of the Rings, dismiss it for having a 'simple' happy ending, for having clear bad and good guys, and for being morally simplistic. Of course I don't think those are necessarily bad things, but it's also true that mankind is at heart rebellious and common grace may lead even to villains not being quite as bad as they could be. And this nuance is reflected in Tolkien's work. The Silmarillion fleshes out the moral realism and complexity of Tolkien's vision. The Elves of The Lord of the Rings are angelic and glorious (having learned from their mistakes), but in The Silmarillion you will meet Elves—some of them the same Elves, like Galadriel—who were rash, headstrong, proud, and rebellious. 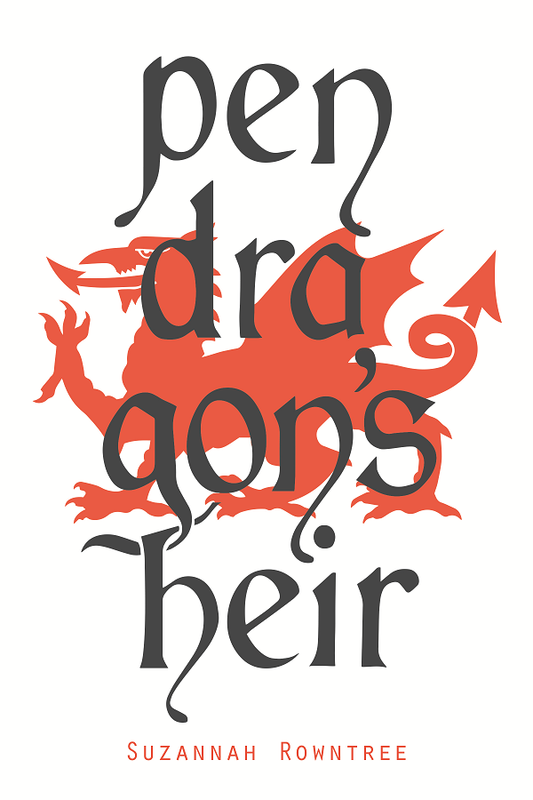 Feanor, maker of the Silmarils and the greatest of Elvish craftsmen, is a passionate, ambitious rebel who, as he lies dying within view of Morgoth's citadel, looks upon it, suddenly realises that his cursed war is in vain and that all his sons and nephews will die unnecessarily in it—but doesn't tell them, instead making them swear again never to forsake that deadly war. Aredhel, a daughter of Fingolfin, unwittingly sets events in motion to ruin Gondolin when she goes wandering around the countryside alone and falls in with the dark-hearted smith Eol. 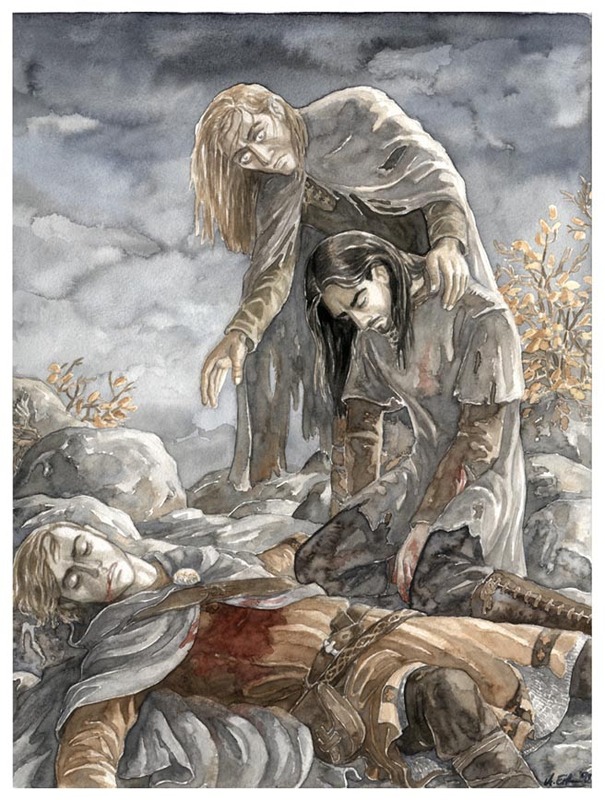 Thingol, the King of Doriath and husband of Melian the Maia, is likewise defeated in the end through his own pride and hubris. The Elven cities of Nargothrond and Gondolin are both destroyed when they trust in their own strength or secrecy to guard them from the curse of the Valar. Turin Turambar names himself “master of Fate” in the belief that he can run his own life, and although he is one of the greatest heroes of mortal Men, his attempts to defy his destiny are feeble and pathetic; the curse of Morgoth works hand in hand with Turin's own arrogance. The Silmarillion is populated with characters that are bitter, proud, foolish, despairing, and vengeful—but also those that are meek, kind, wise, altruistic, and humble, like Finrod Felagund, Finduilas, Beren and Luthian, Earendil, and of course the foils of Hurin and Turin—Huor and his son Tuor. The villains of The Silmarillion may be desperately and demoniacally despicable and evil, but the heroes Tolkien opposes against these villains are an image of the whole human race—flawed, headstrong, ambitious, as likely to be carrying out the designs of Morgoth as those of Iluvatar. The effect is complex, tragic, and gut-wrenchingly familiar: human experience writ mind-bendingly huge. This is, when you think about it, an excellent definition of epic itself, but it is also a good definition of good literature. In The Silmarillion, Tolkien recasts the futile struggle of cursed humanity to save themselves by their own efforts, culminating in repentance and divine mercy. This is fitting, for The Silmarillion is intended to answer the question-- “What would a pre-Christian mythology be like, if it was consistent with true reality yet epistemologically limited to general revelation?” My readers will probably be interested in the aspects of cosmology that come through in The Silmarillion and provide clues to Tolkien's worldview. To set the scene, Tolkien was working with two imperatives. First, he had to portray a world not inconsistent with the cosmological truth as he understood it—Christianity of the Roman Catholic variety. Second, he also wanted to avoid including in that world a 'parody' of Christianity; he believed he could only produce a mockery, and didn't even want to try. Accordingly, Tolkien's mythology in The Silmarillion is recognisably Christian in flavour, but not in detail. Thus the world is created as the incarnation of music (Christian medievals had suggested that the world had been created in song; the same idea crops up in Lewis's Magician's Nephew) but that music is itself 'corrupted' by Melkor so that in a sense the world is created already fallen. Yet the plan of Eru Iluvatar is, as he says in the Ainulindale, to use that fallenness in his own perfect designs—a venerable doctrine of Christianity. Middle-Earth is, remember, a place without specific revelation in a legendary pre-redemptive past. This was why Tolkien did not include mentions of Christ. Interestingly, he did try incorporating something like it at one point in the drafts of his legend: he mentions a prophecy among the race of Men that "the only way Eru could cure the world of Morgoth's poison is to enter it himself." However he abandoned this almost immediately, as I have said, because he did not want to be guilty of a “parody of Christianity”. This feeling of Tolkien's is also the reason why Christianity or any hint of it is so entirely missing from Middle-Earth, and the only organised religion we see is the abominable worship of Morgoth and Sauron complete with human sacrifice. So Middle-Earth is a place with a triune god or God ruling through angelic representatives or messengers who brings his secret will to pass in triumphing over the evil of fallen angels and fallen creation. The history is full of messianic figures (like Earendil, for example) who point forward to a possible redemption of the world which these people hope for but which has not been revealed to them. However they do know that in the end Morgoth will be finally defeated and the world mended. Such was Tolkien's attempt to construct a mythology which would still somehow be recognisably truthful. The Silmarillion is, as you have probably gathered by now, wildly different in some ways to The Lord of the Rings. It takes place in the distant past of that book and is written throughout in the very elevated, epic style which only comes through occasionally in The Lord of the Rings. It is also written as an epic myth, not as a novel, in the style of the Volsunga Saga, the Iliad, the Aeneid, or the Kalevala. In tone The Silmarillion is much more tragic and hopeless than The Lord of the Rings. 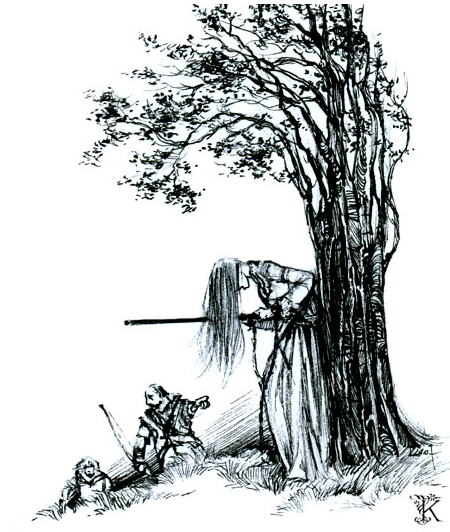 Unlike the characters in that book, many of the major characters of The Silmarillion are under the curse of the Valar and their war is doomed from the beginning (although the book is not a straight tragedy: rather, when Earendil the Mariner finally returns to Valinor to beg for help, he is heard). In The Silmarillion, none of the mighty kings and heroes eventually get anywhere; it takes divine help. By the time of The Lord of the Rings, Elrond, Galadriel, and Gandalf have learned not to put their trust in princes and horses, but in Providence, which is why the fate of the world is left to 'luck' and a humble hobbit. However there are similarities between the two books. Tolkien's genius for epical storytelling is obvious in both and The Silmarillion is packed full of astonishing exploits and desperate last stands, from Finrod Felagund who dies killing a werewolf with his teeth to Glorfindel who dies duelling a Balrog at the fall of Gondolin (the death didn't take, however, and he later returned to Middle Earth, appearing briefly in The Lord of the Rings; he's also, interestingly, the one who made the prophecy that the Lord of the Nazgul would be killed by 'no living man'). As well as containing much valuable backstory to The Lord of the Rings, The Silmarillion is worth reading on its own account as a true epic. Note: I do not necessarily recommend all works by all these artists. I do enjoy these ones particularly though! According to Tolkien's last recorded thoughts on the subject, in The Peoples of Middle Earth, Glorfindel of Rivendell was Glorfindel of Gondolin, re-embodied in the Halls of Mandos and sent back to Middle-Earth by the Valar to help in the resistance of the forces of good to those of Sauron and the Witch-King of Angmar. There is a place in the Appendices of LOTR which discusses some of the fighting Glorfindel does against Angmar in the Third Age, notably an episode where the Witch-King was about to polish off Earnur of Gondor and turned and fled at the mere sight of Glorfindel. That, combined with the subsequent prophecy of the Witch-King's death ("not by the hand of man shall he fall") seems to support the theory that they are the same, given the unusual amount of authority wielded by Glorfindel when we see him. 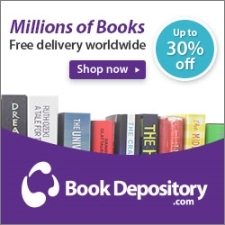 I thought this was pretty widely accepted by most readers, but after a quick look on the internet the discussion seems to be a bit lively, if not quite on a par with the celebrated Balrog Wings, Identity of Tom Bombadil, and Plothole Eagles debates! Haha, thanks for the synopsis! I didn't have a hard time with the first parts of The Sillmarillion, but after getting about halfway through it, I'm quite lost in all of the names. I think I may pick it up in the future again and start from the beginning, and then I'll have a chance of remembering things. It seems like, with this sort of thing, it becomes more interesting to hear or read it when you already know the story. Ah, a very good post, and I am glad to be able to read it. :) I loved the illustrations, especially of Varda. I got mixed up on who Varda was, or even that she existed, as I didn't get the Gilbareth connection. But now I am wrapping my mind around every character's two or three names, and I think I have a grip on it. And Gandalf is Olorin! Well well, that also was a bit of news. I am thrilled. The more I learn about Middle Earth, the more happy I am with the way Tolkien crafted it, and the less reserve I have about it. You said: "and the only organised religion we see is the abominable worship of Morgoth and Sauron complete with human sacrifice" But we also see worship of Illuvatar, not just Sauron's worship. What about Meneltarma, the high place dedicated to Eru in Akallabeth? Obviously, there wasn't an obvious worship of Illuvatar, but I think that could be called organized religion. Oh, and I missed this--how is Eru triune? Excellent post, and I find it amusing that we both had about the same lenght. No one can condense the Sil into less than a 9 page review. ;) I think you might have a higher word count, though. 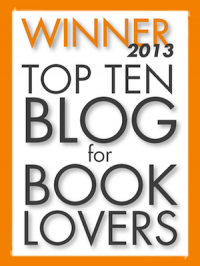 You should review Children of Hurin. I would love to read it. I might do that next after I've recovered from Sil. Though Sil's a little different than LOTR, so I wasn't quite as numb by the end of it. Yes! The Sil does make LOTR a lot more understandable. You're right, Meneltarma is a place sacred to Eru, but even then we don't get much detail on the Numenorean religion. Eru is impliedly triune. There's Eru, the All-Father, there's the Secret Fire (the Spirit), and there's also intended to be a future incarnation, although Tolkien deleted that from his myths. Ah, now I see the triune. Yes, I would have liked to see Tolkien's Christ-figure, but I quite understand why he didn't put it in. 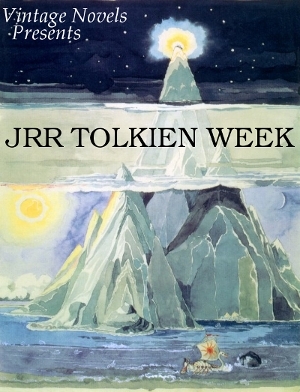 A prolonged Tolkien furlough! May you have success. Having only just begun on him, I can't imagine waiting that long, but maybe after I've surfeited myself I'll see differently. Certainly his works have been the subject of almost daily discussion at our house for the last few months. Even my sister--who has to wait a little before she joins in on the joys--could probably tell you a good deal about them. And she's got the Hobbit trailers practically memorized. 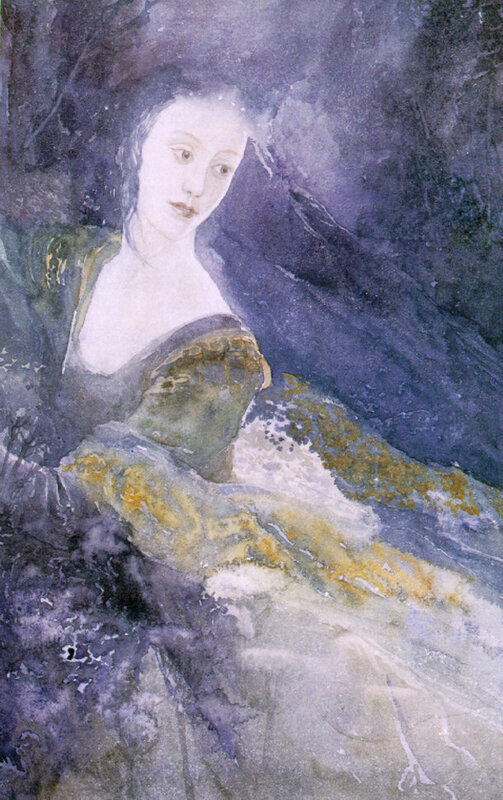 Luthien. 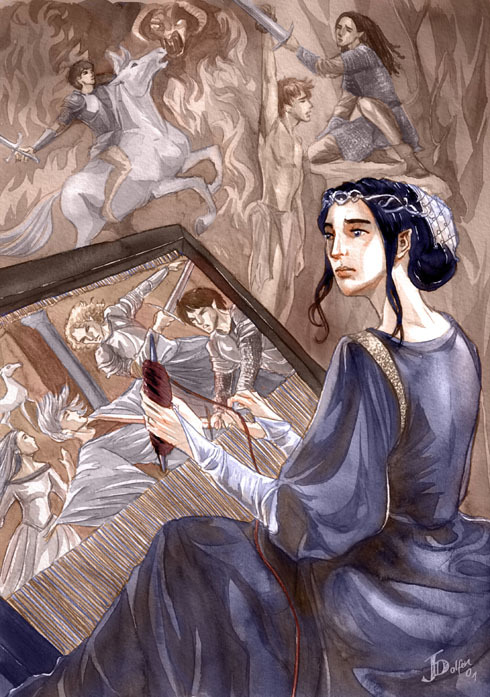 Luthien gives birth to Divine Mercy in the heart of Mandos, thus changing the course of history in Middle-earth.